All good teachers have a bag of tricks, a sometimes endless supply of resources and techniques to keep students engaged in class. Williston teachers have the added benefit of connections with professors and students at colleges in our area, and when these scholars visit the classroom they provide new perspectives on the topic at hand. 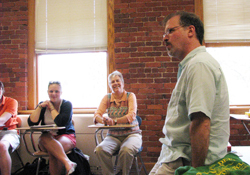 Students in Janice Hanley’s Latin American literature class got the chance to speak with Ilan Stavans, the Lewis-Sebring Professor in Latin American and Latino Culture at Amherst College and the author and editor of many volumes including The Norton Anthology of Latino Literature and The Poetry of Pablo Neruda. In an open question-and-answer session, students asked the scholar about everything from his intellectual path to the cultural differences between “Latin” Americans and “North” Americans. Before Stavans’ visit, the class read Pablo Neruda’s poetry and wrote their own poems in his style. Some students of Spanish took issue with their textbook’s translation of Neruda’s Spanish, and they asked the professor about the word choices translators must make. He earned laughter from the class by saying, “Translations are like lovers. Some are beautiful but not faithful. Some are faithful but not beautiful.” Translating a poem means creating a new poem in the target language, Stavans said, and encouraged them to try making their own translations. The playwriting class, taught this year by Elizabeth Bull, also benefited from a visiting writer. Lisa Meyers, a senior at Smith College and an award-winning playwright, came to the class one Saturday in February. She told the students about her experiences and where she gets her inspiration, then led them in a writing exercise. According to Ms. Bull, Meyers was energetic, cheerful, and gave the class good ideas for their own work. Students in the playwriting class read 10 plays throughout the semester and write their own scenes. They conclude the year by writing and presenting their own one-act plays. 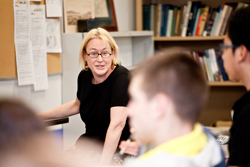 In the History Department, the class taught by Glenn Swanson (“Swanee”) on Hitler and Nazi Germany was visited by Catherine Epstein P’16, associate professor of history at Amherst College and author of the recent book Model Nazi: Arthur Greiser and the Occupation of Western Poland. Epstein is the first Western historian to have written a biography of this major war criminal. The parent of a Williston seventh grader, she met Swanson at a campus reception. When they realized that, according to Swanee, they taught “basically the same class”—she at Amherst and he at Williston—he invited her to present her research to his students. It’s connections like this that make collaborative education at Williston so rich and unique.